What Food Safety Warnings Should You Look For in a Restaurant? All restaurants have to follow proper food safety regulations. It is the restaurant's responsibility to keep its customers from becoming sick. When you walk into a restaurant, you're making an unspoken agreement with the management of that restaurant that you will pay for the food you order and the service that comes with it. What you do not want to pay for are any problems, including health risks caused by putting something into your body that isn’t healthy or safe. The restaurant’s part is to keep its products safe for its customers to eat. However, even the finest restaurant can run into problems now and then. So how can you know if a restaurant is a safe one? The biggest challenge is that you can’t walk back to look at what’s happening in the kitchen. Happily, there is a way to see: by reviewing health department records if they’re available. To learn how to find your area’s health department records, click here. In addition, we’ve developed a system you can use to evaluate your favorite eating places, including a “Red Flag” scale for each questionable activity you may see. We’ve divided restaurants into three groups: Quick Service, encompassing fast-food or counter-service places (like a hot dog stand outside your local hardware store), Buffet restaurants, and Full Service, which covers the sit-down-and-eat places, both casual and fine dining. Some facilities may fit into more than one of these groups, but the basic principles will be covered here. Red Flags are not set in stone. You may want to take a chance with a restaurant, even if you see a big Red Flag, just because you trust the location. It comes down to using your best judgment. We want to help your best judgment become better. 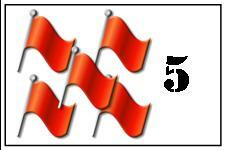 To learn our rating scale on Red Flags, click here. To find out what to look out for in Quick Service restaurants, click here. To find out what to look out for in Full Service restaurants, click here.